Today’s blog needs background music. So click play on the above specifically-chosen video and read on. I bet when you think of this song, many things may come to your mind, but none of which would be crows. The crows here in Japan are HUGE. Let me repeat: HUGE. I’ve always said that they are the size of Chihuahuas. But I recently read that they can grow as long as two feet long. Please measure that out with your hands right now. So, the creeeeeepiest thing happened the other day as we were getting ready to head out. We have a friend staying with us for the summer who is lodging in our daughter’s room. We were getting last minute things ready and all of a sudden, our second story window caught my eye (we live on the second floor). About 20 crows or so were cawing and swooping up and down outside of the wires that are quite at eye level for us. I was like, oh my goodness, look outside! My friend gasped. It looked like something out of a horror movie. Imagine- (20) 2 feet long, Chihuahua-sized birds literally within 20-30 feet of you swirling around like kamikaze animals. We left a few minutes later after gawking from the window. All the massive birds were still there with their haunting caws swooping around and I was a bit on edge, I’ll admit. We began our walk down the street, thankful to be leaving what seemed to be their airspace. But, as we approached a walled property along the sidewalk, probably 5.5ft in height, we were literally 2 feet from approaching the wall when (again, I’m not ashamed to use it) literally 8 or 9 crows landed to sit on that wall all in a line AT THE EXACT SAME MOMENT. Now these birds were just short of being at eye level. It was the craziest thing ever. As we both gave a jumped pause and I kept my gaze straight ahead to keep walking. Not one bothered us, and most few away as we approached. -Crows can remember your face… as proven by scientists and many other internet users. One user said that he had thrown a rock at a crow and a year later that crow occasionally dive-bombs him out of nowhere. Now you know why this song is so appropriate. -Crows communicate with one another and have dialects. They also apparently communicate to each other about people they don’t like. Not only that, they apparently communicate this info for generations, according to scientists. -They have crazy memories and have been known to change entire migration habits to avoid an area where even one crow was killed in the past. They memorize trash schedules to optimize their feedings. -They are crazy smart and uncannily handy. Think chimpanzee smart. They are well-known to perfectly time dropping walnuts in front of cars in order for them to be cracked open. -Japanese crows live 7-10 years in the wild. They’re actually a pretty big problem here because their predators are not around in Tokyo. 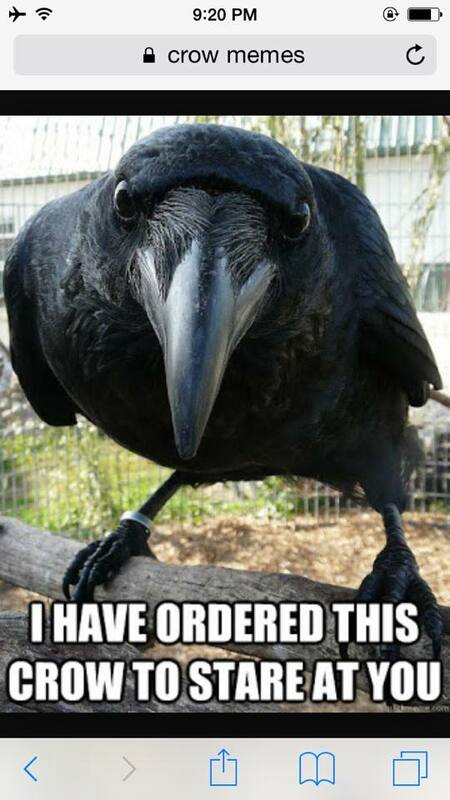 So now you know: don’t mess with crows. My friend sent me the following picture which I’ll leave you with. Now picture 10 of those life-size.